These tiles are a specialised version of the base "Open Space" urban tiles you get in main sets and/or as extras. This is special design, intended to enhance your urban sets with game/campaign specific mosaics. By choosing this add-on, you can add any number of extra Open Space Tiles to you Base Urban Set, but they can have a custom motif engraved and painted on them. Make sure you choose the same Theme as the one in your main Set. You have to pre-order a Base Set before adding any more tiles and/or base sets in your order. 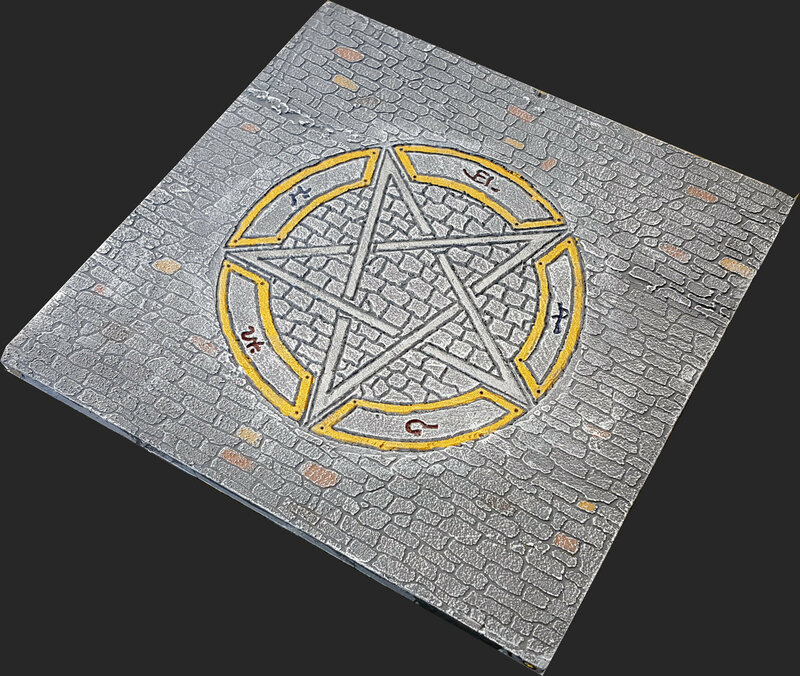 Please add only one such tile per Base Set included in your Order! The idea is that by ordering an Open Space tile with Custom design, we can engrave a special mosaic to adorn your battlefields. It can be a motif which will make the urban set look the role for specific game universes or scenarios. And, you can always remove it and use a standard open space tile when you play something else. If you want us to implement a custom design of your own making, you can get an idea from the 3 we already have whether it is feasible or not. The design must be drawn in some detail (no oral descriptions qualify) and must fit an area of maximum 20cm in diameter. Please Contact Us to send us the design request, or just for inquiring whether the design you have in mind can be done. Please keep in mind that if you ask for extremely complex and/or demanding designs the tile cost may rise. adhere to all Pedion design parameters: full molecularity, simple connectivity, thin, lightweight, durable, easily stored.